What's the roughest part of Scotland? I'm not talking people, but terrain. It is surely Knoydart, or The Rough Bounds of Knoydart to give its full title. So the clue is in the name. And wouldn't a walk through the roughest country in Scotland make a good challenge? Many years ago I walked this approximate route, between two freshwater lochs and three sealochs. The country is genuinely rough, especially around the head of Loch Morar, an area that sees few visitors due to a lack of Munros. 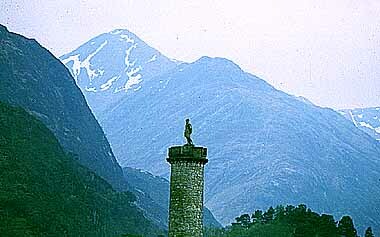 You start at the railway halt of Glenfinnan and its Jacobite statue at the head of Loch Shiel. It was here in 1745 that the Jacobite flag was unfurled as Charles Stuart ('Bonnie Prince Charlie') gathered his first small army of Lochaber clansmen. A year later he was back in these hills evading redcoats, the roughess of the country an advantage. So let's head into the hills, under the 'Harry Potter' viaduct. It's the last road we'll see for a few days. 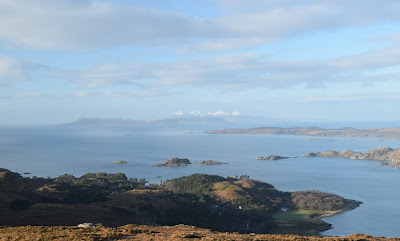 There are various ways to reach Loch Morar. The least direct and easiest (and the route I took) is to head NE over a pass to Strathan and then W up ever-narrowing Glen Pean where the v-shaped valley floor becomes choked with boulders from an ancient landslide and you have to carefully pick your route. 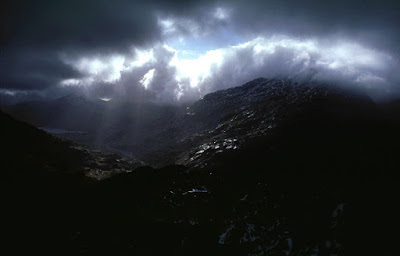 This is a particularly atmospheric place, the cloud-flirting face of Carn Mor towering above in terraces of torn rock. 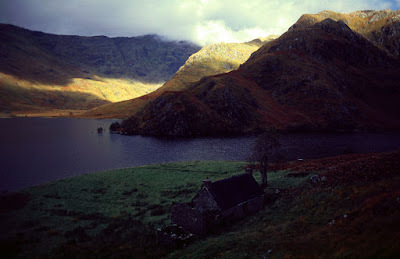 A path appears and tumbles you down to Kinlochmorar and the bothy of Oban. 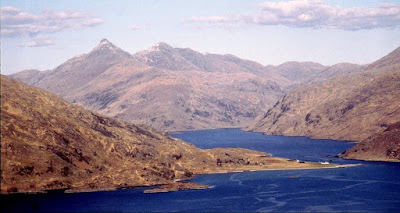 There are no easy ways onward: plunging shorelines must be negotiated before reaching the north side of the loch, and the choice of whether to take to the hills for Loch Nevis or stick to the longer but easier trail through the glens and passes. From the well-placed bothy of Sourlies on Loch Nevis, the wild glen of the River Carnach takes you to the mountain pass of Mam Unndalain and the shores of Loch Hourn, which I have never yet seen except in the pishing rain. After walking the length of the loch on a rough, up-and-down path with boots full of water and a soaking coat you may be tempted to bail out at the single track roadend at Kinlochhourn. But be aware: it is 20 miles along this road before you reach a junction where you might reasonably be able to hitch a ride to civilisation. 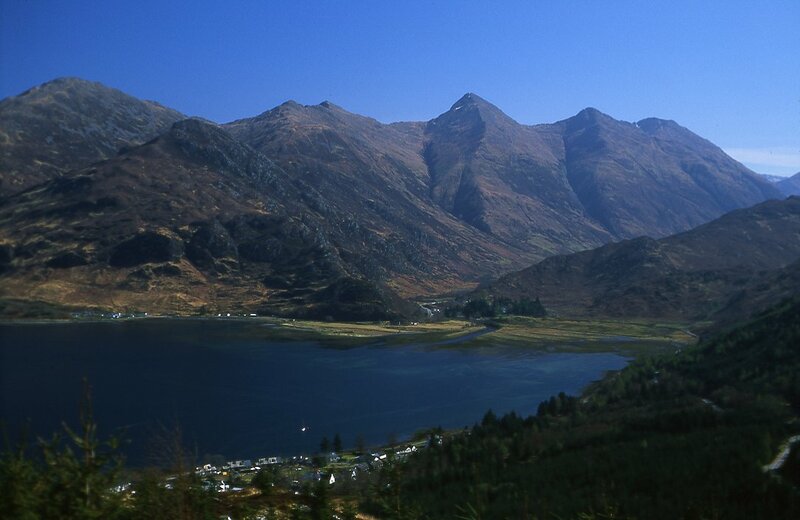 It is easier to complete the walk and take further mountain passes for Glen Shiel and Loch Shiel, and a night in Ratagan Youth Hostel or the Kintail Lodge hotel where a wash and a meal beckon. This final section is the least satisfying unless you intend to finish with a couple of Munros: there are several possible routes, and I ended up with a stretch of road walking on the A87 before being picked up by a car as I hitchhiked home. I never got as far as Loch Shiel that first time: I had to get home to sign on at the Jobcentre. But it was a walk that stayed with me for the gloom of the weather, the effort of traversing the terrain, and the lack of company: I met a couple of people in two of the bothies on the route and saw nobody else the entire time. If you want to experience a trek in Scotland - if you really want to experience a trek in Scotland - you would be hard pushed to find a more memorable route.